Even though most of us have never been to Bethlehem, it feels like we have through this song. 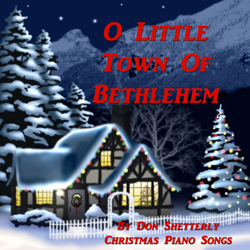 O Little Town Of Bethlehem is very recognizable as a Christmas song. The words go hand in hand with the music to paint such a beautiful story with words. It is one of those songs that has a feeling of lightness and calmness. The notes carry you from one moment to the next. Track #9 of 15 songs on Christmas Piano. In 1868, Phillips Brooks, a Bishop In Philadelphia wrote the hymn, O Little Town Of Bethlehem. A church organist by the name of Lewis Redner created the music from a dream he had. Phillips Brooks was recalling a trip to the Holy Land in 1865 where he visited Bethlehem while writing the words to this song. This hymn was actually written for children in Phillips Brook’s Sunday School in his parish that he attended. The hymn was printed on an informal leaflet in 1868 and then appeared in the Sunday School Hymnal in 1871. According to history, Phillips Brooks traveled on hoseback between Jerusalem and Bethlehem on Christmas Eve. Before dark he rode out of town into the area where shepherds saw the star. There is an omitted original fourth stanza that was written for the children. Charles Wesley’s original song was made up of ten four-line verses, rather than the eight-lline longer verses currently. I have a different source that says it was first published in 1739, so there is a conflict in my research that I cannot resolve at this time. I believe that the difference is that it took many years with different people to perfect it and get it into the version we know today. George Whitfield also cut the final verses, which are now mostly forgotten. It has been stated that Lewis Redner felt a line, Son of the undefiled, led to some criticism because of the immaculate conception. He changed that line to read, Son of the Mother Mild, but later omitted the third verse alltogether. The hopes and fears of all the years, are met in thee tonight.